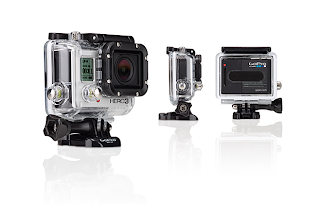 Spend just a few minutes on the GoPro Hero3 Black Edition web page and you’ll see some of the most fabulous shots taken by GoPro users – surfing, underwater swimming, biking through treetops, motorcycle riding, you name it. So what could I do with my new GoPro to top those guys? Considering that I’m now approaching retirement, probably nothing quite that strenuous or exhilarating. What I’m really looking for now is an assistant to make things easier – not harder. You know, somebody to carry an extra camera, who can capture those shots that I might miss while I’m shooting something else. After being inspired by all the shots of riders with multiple cameras affixed to their helmets and handlebars, it occurred to me that I could attach a GoPro to the DSLR camera I’m already carrying. It sure doesn’t weigh enough to impede my shooting. When things get interesting, it’s a simple thing to press the Record button on the Hero 3's remote and just let it roll until the battery runs out. While I’m waiting for the peak of the action, or just the right expression, the GoPro is recording it all in 1920x1080 high-definition video at 30 frames per second. If I miss the smile or the peak action, it’s sure great to know that my assistant – let’s call him Hero 3 – has grabbed the shot for me. Earlier this month, I had a chance to jump on the Press Boat to cover the re-enactment of the Battle of Lake Erie between Ohio and Canada. We had no idea of how the action would unfold or what type boat we’d be sailing on. Turns out, we got put on the most fabulous tall ship ourselves, but we wouldn’t be sailing up close to any of the other “combatant” ships in the re-enactment. That meant I’d be shooting all day with my biggest telephoto. of my DSLR. That way, between shots, while I was changing positions, my GoPro was running and capturing some of the beauty of the ship we were sailing on. It was also recording wide angle shots that I can use for backgrounds later when doing page layouts for a photo feature. This was my first experience using the GoPro so I was anxious to see the quality. The day started out rather dreary, so I honestly wasn’t expecting too much. As the sun began to break through, things began to look up. It turned out to be a beautiful day and I was incredibly impressed with the images recorded on the GoPro, both during the light rain and in the intense mid-day sun. The attached video should be labeled: Photos and video by Hero 3, since I never touched the shutter to take any of these. They were all taken with the camera running while I was concentrating on other things. But hey, assistants don’t get bylines, so it remains: Photos by Doug. The stills are all just frame grabs I did while reviewing the video playback. The sharpness, contrast and color I think are amazing. I can’t wait to use this for other situations. This was all made possible with the LCD Touch BacPac accessory. With a real time video screen showing you what’s being captured, I could align the GoPro very easily with my DSLR. 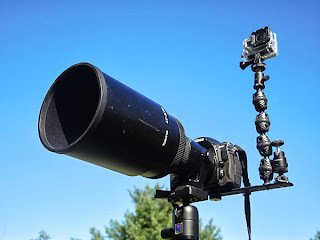 It also told me that if I wanted to use my giant f2.8 300mm lens, I would need to jack up the GoPro to avoid getting the lense in the shot. Conversely, when I use a small point and shoot, even at widest angle on my GoPro, the camera is not in the way. The camera’s specs are amazing, with as many different video shooting modes as you could ever want. Pick anything from WXGA up to 4K Cin. I used 1080p and was quite happy. What you are looking at on YouTube or Vimeo is a compressed and reduced version of what I see on my desktop, but it still looks awesome. 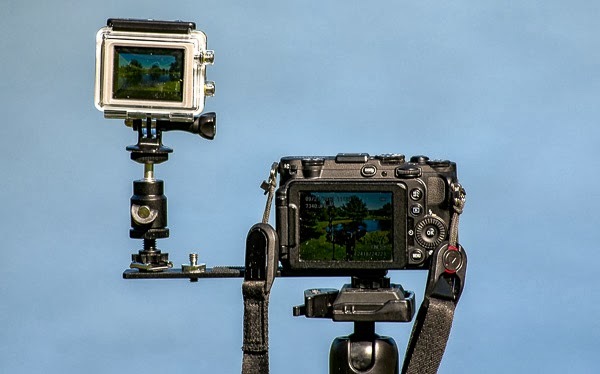 In still camera mode, you can shoot resolutions from 5 to 12 MP, bursts up to 30 per second, continuous shooting at 3, 5 or 10 frames per second or time lapse at 0.5, 1, 2, 5, 10, 30, or 60 second intervals. This assistant has got it together. 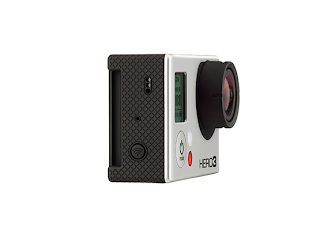 Hero 3 also lets you control any all video/camera settings from your smartphone using the free GoPro app available for iOS or Android. While the Hero 3 Black Edition comes with a remote control, you can also control your camera with full live video preview using the app. Watch the video below for all the details – very full-featured and works amazingly well. 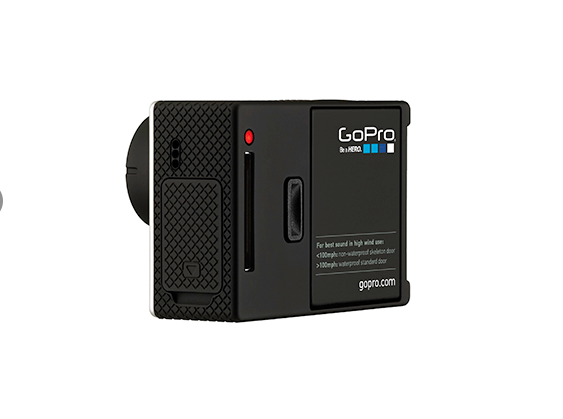 With all the mounting options available for GoPro and now with two additional batteries charged and ready to go, I can see lots of other opportunities to use it. I can even monitor the action and record it from around the corner, in the next room. Maybe I'll call my assistant James Bond.